It’s difficult to choose the perfect kitchen cabinets on the Outer Banks to complete your kitchen. You wouldn’t think it, but there are a ton of models to choose from including the shape, color and finish. Armstrong cabinets have an amazing selection of kitchen cabinets, though, and they would be a perfect addition to any kitchen. Take a look at the Arch style cabinets, for example. These kitchen cabinets can create walls with a true personalized style. Kitchen cabinets with eyebrow and cathedral arch doors can compliment the room and make a classic traditional statement. Cathedral: has a more country-casual feel and will add interest to any kitchen or bathroom cabinets. 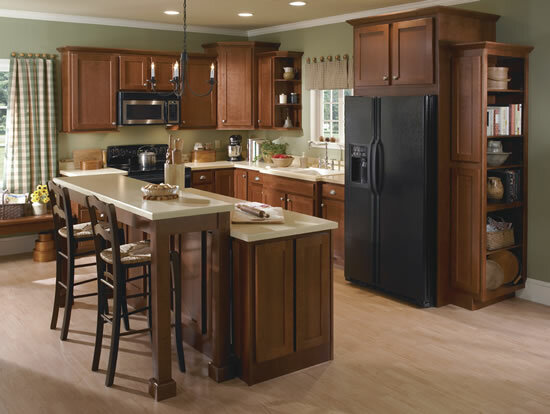 LaCerise Arch: this classic styling and fine cherry wood cabinets create elegance for kitchen cabinets. The dramatic styling can be seen by the beauty of square, raised panel, full-overlay doors and drawer fronts. Choose between square and eyebrow arched cabinets. Berkshire Arch: offers the satin smooth, clear grain beauty of maple, which gives it a very elegant and sophisticated transitional styling advantage. Tiara Arch: this type of kitchen cabinet is a treasured maple known for its close-grained, uniform look and natural beauty. It combines the elegant maker’s art with a valued maple. Waverly Arch: a great choice if you like natural hardwood cabinets with the patterns and texture of maple hardwood. It’s satin-smooth with a clear grain beauty of maple that gives it a very intelligent traditional styling feel. Hampton Arch: has a solid look, quality, and oak for cabinet front frames. It’s accented with a step and rolled edge on the door that complements the profile of the center panel. Installing arch style cabinets into your home would only add brilliance to your kitchen or bathroom. If you’re looking for new cabinets to complete your Outer Banks kitchen renovations, CK Custom Kitchens will gladly help you. CK Custom Kitchens is a proud distributor of Armstrong cabinets, so if you’re look for great quality, you can look no further!